The summer will arrive in the blink of an eye along with the high temperature and lightweight clothing. 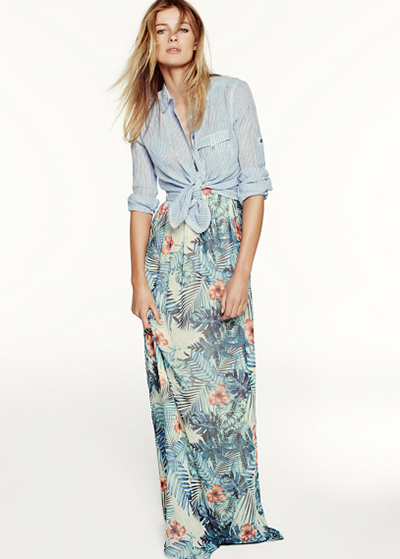 Popular high street brand Mango presented its Summer 2013 collection that is not only flirty but also utterly trendy. After launching the Mango Summer 2013 campaign with stunning Miranda Kerr, the brand allows us to take a detailed look at its Summer 2013 collection. Playful, delicate, lightweight and vibrant, this latest Mango Summer 2013 collection is quite comfy and versatile. Moreover it embraces the key trends of this season with an effort to satisfy the distinct preferences and tastes. The collection comes in a few lines, where each features the particular theme. Regardless the trendy silhouettes and edgy cuts, this Mango Summer 2013 collection is very versatile, comfortable and wearable and allows you to incorporate the hottest trends of this season without looking too bold. As summer is considered to be the perfect season for traveling, this Mango Summer 2013 catalog includes the lovely garments that are ideal for traveling. Called The Tourist, this line features the statement prints and patterns, an abundance of colors and ethnic motifs. Black, red and white combinations, trendy floral and geometric prints along with the turquoise and gold elements make this Mango The Tourist line even more appealing. As for the garments, it includes the must-have garments for summer like skinny trousers worn with white tops with boho feel and original jackets, pants with paisley print teamed with red-colored tops and blazers, chic one-shoulder shirts, playful mini shorts, sophisticated jumpsuits and dresses. White is a timeless summer fashion staple, which should be in the wardrobe of any fashion-forward girl. Luckily this Summer White 2013 lookbook delivers the White line, which includes the romantic garments with the delicate detailing, crochet, lace and embroidery. In the lookbook white tops are teamed with the faded chambray and white jeans. So even if you are not a big fan of white, you will surely become one once you take a look at this Mango White Summer 2013 lookbook. This line is my favorite. Entitled the Jungle Heat, this Mango Summer 2013 lookbook features the exotic palm leaf and hibiscus flower prints in the bright hues like yellow, green, blue and red. Besides there are also one-color garments in beautiful emerald green, sky blue and corral red. This line consists of the cropped tops, playful dresses, printed trousers and blouses, skinny jeans in bright hues and shorts, breezy maxi dresses, t-shirts and various accessories. Cobalt blue is one of the trendiest colors of 2013. Beautiful and rich, this color is as loud as never before. This Mango The New Blue Summer 2013 lookbook is devoted to cobalt blue and offers miniskirts paired with yellow tops, minidresses and tops teamed with skinny trousers, all in this dramatic hue.